The first three chapters of this book are very personal in nature, as Paul writes of his feelings and relationships to the believers. The final two chapters are practical and doctrinal, concerning end times and behaviors in the fellowship. This first chapter is almost entirely one of Paul’s love for and joy in the believers in Thessalonica. The Book of Galatians is the only letter Paul wrote in which he did not follow this practice of opening with praise and thanksgiving–and that’s a study for another time. Because Paul makes such a point to preface every prayer with thanksgiving, we need to take a look at his practice. First, he uses the plural pronoun we. This is not an editorial we, but a reference to Silas and Timothy who joined him in his thanksgiving for the believers in Thessalonica. They all had a very important part in establishing the community of believers there, and all maintained an interest in the work. The thanksgiving is directed to God, Who is the author of salvation. In the Greek language, Paul made it clear that he was not referring to just any god in an idolatrous culture; he used The God to make it clear that he was referring to the one true God. Every word is important. And by directing his praise to God, he was making it clear that he and the other missionaries took no credit to themselves. Every work for God must be of God, or it will not succeed. This emphasis seems to be such a small thing, and yet it is foundational to our understanding of Who God is. When we assume that we, in our own strength, are going to do God a favor and establish some mighty work in His Name, we are doomed to failure. If He, on the other hand, chooses to use us to build what He has already decided to do, then we are the favored ones! It is our privilege to work for Him under His direction to do what He has willed for us to do. We do God no favors when we see ourselves as the moving force in doing His work. He does us a huge favor when He allows us to participate in His work. We really need to get our thinking straight on this matter. I believe it is one of the reasons there has been such persecution committed in God’s Name down through the centuries; it is because man has decided what he will do for God, and anyone who doesn’t acknowledge the rightness of it will suffer. How can God be honored when people are destroyed under the guise of righteousness? One more note on verse 1. The “grace and peace” greeting is typical of Paul’s letters, but it is not just a turn of phrase, It is inspired of God, so it bears a closer examination. Paul’s prayer for the readers was that they experience both the grace and the peace of God. So what is he actually saying? Since I’m a semi-retired English teacher, it is important to me to define terms. Be patient, please. Grace is the free, unmerited favor of God poured out on guilty man through the substitutionary death of Jesus. Unmerited. Unearned. Undeserved. Through no goodness of our own, but through the goodness of God and His Son. Freely available to all who believe and put their trust in Jesus Christ, grace is one of the best gifts of God to us. Peace is what we get when we accept His grace. It is that inner tranquility and well-being that passes all understanding (Phil. 4:6-7) and that floods our souls when we pray with a begging fervency, with thanksgiving in our hearts for His promise to supply all our need (Phil 4:19). Peace. The Thessalonian Christians were in trouble, but Paul reminded them that their peace would come from God if they remembered to put their trust in Him. A timely reminder for believers around the world today as pressures increase to turn away from Christianity to almost anything else. The hearts of all kings, dictators, or presidents are in God’s hand. If Paul were writing his letter today, he probably would have used our shorter form of greeting. I like his better. There is a depth of love and caring conveyed in what seems to us to be a lengthy “hello,” but that was typical of his time and place. First, the writers: Paul, Silvanus (Silas) and Timothy. It was the practice back then to state right away who the writer was, which actually makes a lot more sense than waiting until the end of the letter. Paul’s name naturally comes first as the leader of the group and through whom the Holy Spirit spoke. Paul includes Silas and Timothy as his coworkers and supporters of the work in Thessalonica. Paul often uses the pronoun we as he writes, always inclusive of Timothy and Silas. It may have been one of them, rather than Paul himself, who actually penned the words; Paul is known to have used an amenuensis in other letters. A side note here, just a matter of interest. You will remember that Paul was born a Roman citizen. His Jewish name was Saul; his Roman name was Paul. Why his parents chose two names sounding so similar is an unanswered question, but it was very common for Jewish babies to have both Jewish and Roman names given to them at birth. The name Paul means little. Some have taken this to indicate that he was small in stature, but that is really just conjecture. Likewise, Silvanus is the Roman Silas, lest there be any confusion. Luke always refers to him as Silas, but Paul always uses Silvanus. Refer to Acts 15:40, Acts 18:5, and 2 Cor. 1:19. Timotheus is the Roman Timothy, who was the youngest member of the trio and was half Jewish, half Greek. Second, the readers: The church (ekklesia, called-out ones) of Thessalonica. This letter was written to a specific group of people for specific needs that Paul would address. Of course, his letter has become open and applies to all believers across the intervening years, but its original intent was as a personal word of encouragement and instruction to the new converts in Thessalonica. Third, the greeting grace and peace. This is not to be taken lightly. It was Paul’s prayer, direct from the heart, that the Thessalonian believers enjoy the grace and peace of God in what was a very difficult time for them. He loved them, and he was concerned for them because he knew they were being persecuted by the angry Jews who had rejected the gospel. Notice that Paul invokes the Names of God the Father and the Lord, Jesus Christ twice as he greets the Thessalonians. There would be no church without God and His Son. God’s Word was inspired, God-breathed. Every word is important. There is nothing God says that we can lightly slide over and consider as unimportant. Every time I do a study like this, I am impressed with how little attention we pay to the importance of every word. The chronology in Acts clarifies that I Thessalonians was written during the second missionary journey. It’s almost certain that the letter was written from Corinth. Paul had sent Timothy back to Thessalonica from Athens (I Th. 3:1-2) and this epistle was written upon Timothy’s return from there (3:6-7). From Acts 18:1 and 5 we learn that Silas and Timothy rejoined Paul at Corinth on their return from Macedonia, following Paul’s return from Athens to Corinth. The work of Paul at Corinth offers one of the most certain contacts with secular chronology because it was partly parallel with the proconsulate of Gallio (Acts 18:12). Proconsuls were usually in office for only one year, so we can pin the date of the writing of I Thessalonians pretty closely as a.d. 51 or 52. There’s a very interesting store of information online if you’d like to read about the narrowing down of this date. Google Gallio and/or Emperor Claudius and you should find confirmation of Gallio’s time in office, which is coincident with the time Paul was in Corinth and was brought before Gallio by the Jews who wanted Paul silenced. 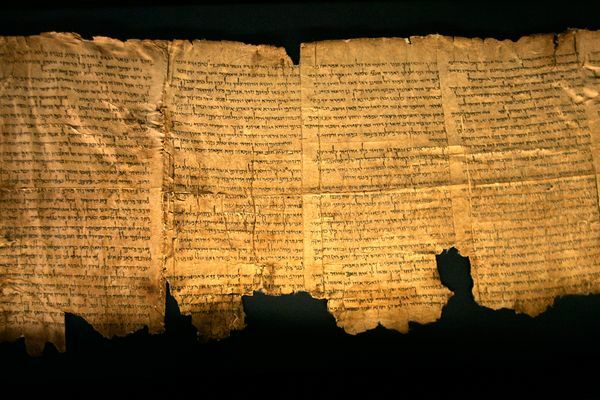 In any case, the letter was written within 20 or 21 years of Jesus’ return to heaven, and as far as we know was the earliest of the Pauline epistles. Authenticity is important for all of the books in the Bible. There is almost no challenge to Paul’s authorship. It rings true with all of Paul’s other writings. His style is unique, and the rest of his letters to the churches follow the patterns he set in I Thessalonians. Set in the historical background, and in conjunction with Paul’s journeys and church plantings, it is completely consistent. Even the critics who challenged its authenticity have now agreed that there is no question that the letter was Paul’s. Next time: Finally, we’ll start reading the letter! 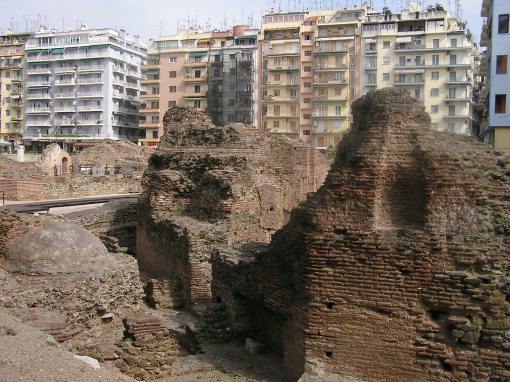 I am fascinated by the juxtaposition of modern high-rise apartments and under-the-ground ruins. I’d love to go there someday. After Paul and Silas fled from Thessalonica to Berea, about 40 miles, they were joined by Timothy. However, their ministry there was again disrupted by the trouble-making Jews from Thessalonica. Once again, Paul needed to leave quickly and quietly. Silas and Timothy stayed in Berea while some of the Berean believers got Paul safely to Athens. When they returned to Berea, they gave Silas and Timothey an urgent summons from Paul for them to join him in Athens (Acts. 17:10-15). Paul had a pastor’s heart. He yearned over his new converts, longing to be able to remain with them and teach them, and comfort them in their suffering. He worried about what the angry Thessalonian Jews would do to the new believers. So Paul sent Timothy back to Thessalonica to encourage the believers there and to bring back a report about their welfare. Since Timothy had not been there with Paul and Silas, it was safer for him to be the messenger. When Timothy returned to Paul from Thessalonica, the report (I Thess. 3:6-7; Acts 18:5) relieved Paul’s worry and gave him cause to be very thankful. In response, he sat down and dictated this letter, which is full of his love for the believers as well as his instructions to them. If we remember that Paul’s letters were very personal, an outpouring of his heart for God and for the people he served, it will change the way we see these letters. They are not simply dry works of doctrine and lectures. They are the overwhelming expression of Paul’s regard for the people, and a direct report of the work of the Holy Spirit in Paul’s heart. What excitement must have been stirred whenever a letter arrived at any of Paul’s churches! The clear purpose, from the context of I Thessalonians, was to record the reactions of the writer and to meet the needs of the readers. First, Paul records his joy at the good news Timothy shared concerning the faith and courage of the people. Read Chapter 1 and, understanding the background, see if it doesn’t bless you to rejoice with Paul in the maturity and strength of the Thessalonian Christians. A second purpose was to refute the false charges and slanders against Paul and Silas that the angry Thessalonian Jews were circulating. They were accused not only of heresy against the Jewish faith, but also of insurrection against the authority of Rome. This last accusation could have gotten them imprisoned or killed, which is apparently what the Jews had in mind. The attacks were personal as well, an effort to discredit Paul and Silas in their character in order to cause division between them and the new believers. They used such things as the Philippian offerings sent to Paul to accuse Paul of being in it for nothing more than personal gain. They also accused him of cowardice in leaving secretly rather than facing his accusers, and Paul’s defense is simple: His efforts to return had been hindered, and he sent Timothy in his place. It must have been very hard for him to let Timothy go, having loved him as a son. A third purpose of the letter was to address specific needs in the church, which you’ll find in the final two chapters of the book. Next: The place and date of I Thessalonians. Here’s a helpful website that puts the missionary journeys and the letters to the churches in chronological order. I don’t know anything about the sites authors; but at a quick glance, it seems to me that the information is fairly reliable. Remember: Just because you saw it on the internet doesn’t make it true! Chronology of Apostle Paul’s Journeys and Epistles. 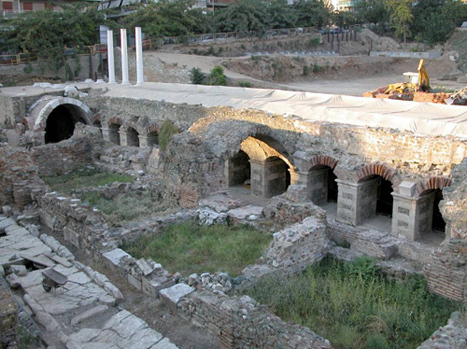 Ancient ruins of the agora (marketplace) in Thessalonica. Perhaps Paul saw this when he preached in the city. In Acts 17:1, Luke states that there “was a synagogue of the Jews” at Thessalonica. I did some internet searching today and found lots of pictures of beautiful modern synagogues, indicating a strong Jewish presence there today. I was hoping to find something much older, and maybe sometime I will. Wherever it was possible, Paul always started the work of establishing a new church by preaching in the synagogue. His audience there would understand the underlying principles of his faith, and were familiar with the Old Testament texts on which he based his argument. Can you imagine the mixed bag of reactions Paul must have received as he began preaching? I’m sure there was keen interest, especially on the part of those who may already have some familiarity with this new Christianity; there would be doubting attention given by some, and furious anger on the part of those whose position and authority were upset by the gospel Paul carried. Not too much different from today, really. It is interesting that the synagogue audience in Thessalonica was composed of both Jews and “devout Greeks.” This Greek component was the most open to his message, probably because they were already seeking the truth and had been drawn away from their pagan gods by the purer ethical teachings of the Jews. They had not necessarily converted to Judaism, but were drawn to the worship of Jehovah. The introduction of Christianity had great appeal for people who were not attracted to the rigorous, ritualistic demands of Judaism but who longed for a better way than they knew in the worship of pagan idols. Apparently Paul and Silas stayed for at least three weeks (three Sabbath days) before the unbelieving Jews forced them to escape to Berea in the night. However, it is possible they were there longer. I Thess. 1:9 and 2:14 indicate that many of the converts there were won directly from heathenism. There is some controversy among Bible scholars and historians about Paul’s ability to win so many converts in such a short three-week span. I won’t go into that here; what is important is that there were indeed many converts, and a church was established in Thessalonica which became an important support and center for further evangelism. Next time, we’ll look at the occasion and purpose of I Thessalonians.